We’ve been on this roller coaster before, but recent heat in southern Southeast Alaska took us to new heights. 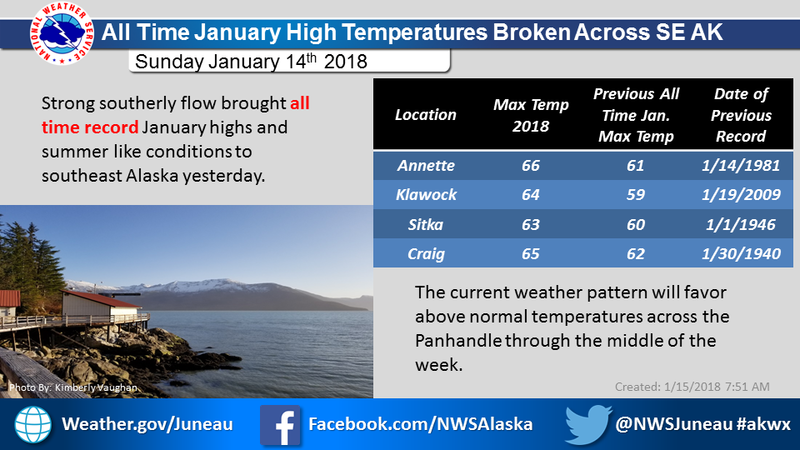 Sunday, January 14th saw many records broken around SE including a new record high for any January temperature in any place in Alaska with reliable records. 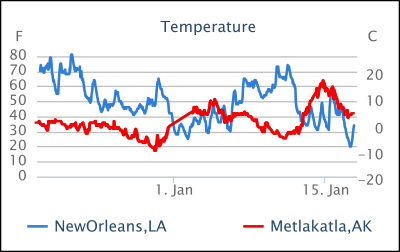 The new record of 66 F (18.7 C) was set at the Metlakatla Climate Reference Network station (read: reliable) as well as the nearby Annette Island airport observation. A few miles north, the automated station at Metlakatla seaplane base reached 65 F (18 C) at around 7pm and it stayed unseasonable warm all night. Sunlight had little to do with these temperatures. Strong south or southeast winds had a lot to do with them. More on the causes later. This is down in the southernmost part of the panhandle, but 60+ F weather was wowing Alaskans as far north as Sitka, with mid 50s throughout the rest of the panhandle, including Yakutat. The strong warmth aloft pushed well north onto the continent as well, with the Yukon Territory and the extreme eastern interior of Alaska warming to the mid to upper 40s. Eagle, way north on the Yukon, warmed to an apparent daily record high of 48 F (9 C) on the 15th. Interestingly, there were a few cooler pockets in Southeast where the warm air did not have enough time to fully invade. While Haines Airport hit 55 F (13 C) on the 14th, 35 miles (55 km) up the valley the customs station was 38 F (3 C). Similarly at Hyder, though just 90 miles (145 km) from the new record at Metlakatla, only made it to 33 F (0.6 C). Both of these stations are tucked far up a fjord or valley and often the warm air goes right over them. Many of these same places mentioned above were quite cold just a few days or a week or two previous. Metlakatla? (Metlakatla is the village on Annette Island…somehow their airport weather station took the name Annette, but now the CRN station (close to the airport) goes by Metlakata 6S). It was 8 F (-13.4 C) — one degree off the 1964 airport record low — just a couple weeks earlier on 12/30. Eagle? Just 6 days prior to the balmy 48 F (9 C), on the morning of the 9th, the temperature there was at a low point of -41 F (-40.6 C). In fact it’s been a winter of big ups and downs. While it is not uncommon for these swings to happen in winter (see here), there are some trophy sized swings shown in the graphs below. Keep in mind that the scale varies on these, making some look more or less impressive on first glance. Also, the records shown by the pink and light blue areas are in some cases based on short time periods, such as with the CRN stations (Metlakatla and Gustavus), or when older data was just not included for whatever reason. Check the Period of Record shown at top. PS I’ve thrown in Gulkana and Anchorage to show that they’ve been on the ride too, as has Fairbanks. Other parts of the state not so much. Click for larger versions. What’s behind the roller coaster? More warmth? Or more cold weather as I speculated in my last blog post? First off, a quick review of November and December. Virtually all of SE was below average for November, ranging from just below in the south to over 6 degrees F (3 deg. C) colder in Juneau. December went the other way. The southern half was about the same amount to the warm side as it was cold in November, but Juneau and the northern areas were only about 1-2 degrees above average for the month. From here out the Climate Prediction Center seems pretty confident in colder-than-normal weather for SE and Southcentral, sliding to relative warmth for the far north and west. More maps and info at the CPC website. So I’m sticking with the original long-range educated guess…a colder winter overall. Of course there may be more roller coasters, but once past January they tend to settle down a little. Questions, comments, votes for warm vs cold? Please use the comments form below.